ADAA's two-part Collectors' Forum during The Art Show, Catalogues Raisonnés: An Exploration of the Model, took place Friday, March 9 at 6:00 pm and Saturday, March 10 at 10:30 am at The Park Avenue Armory. The panels investigated how Catalogues Raisonnés are established and employed by curators, gallerists, lawyers, and artists' foundations. Both panels were moderated by Bruce Altshuler, Director of the Museum Studies Program at NYU. "R Diebenkorn CB Lid #4 1976" on reverse. Courtesy of The Grant Family Collection. 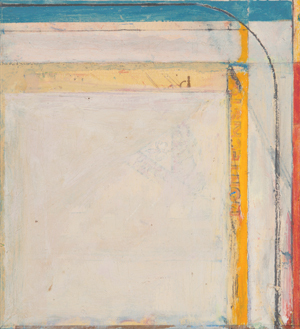 Richard Diebenkorn, Cigar Box Lid #4, 1976, oil and graphite on wood. Of Counsel, Patterson Belknap Webb & Tyler, former Senior Vice President and General Counsel of Christie's Inc.